One of my favorite dinners is made with leftovers. That's right - leftovers! I use these leftovers to make a frittata. A frittata is basically an Italian baked omelette. You'll not that this isn't a recipe as much as a technique. 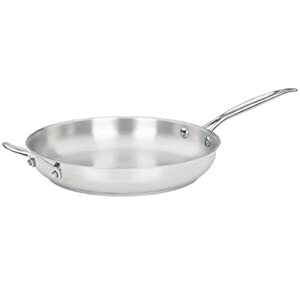 The first thing I do is get out my 12" stainless fry pan (like this one). I love this pan, and it is great for this meal because 1) I know that if I fill it, the meal will be just the right size and 2) it can go on the stovetop AND in the oven or under the broiler. I start heating this on the stove at medium heat. I'll add either a tablespoon of olive oil or just spray the pan with cooking spray. Olive oil works better, but I don't generally want the extra calories. I get out my leftovers. I like to make sure that I have some protein (leftover steak is fantastic with eggs) and some veggies and some pasta, potato or rice. I first cut them into fairly small pieces. Then I add them to the pan to make sure they warm up together for a bit. I'll usually add the meat first, then the veggies and last the pasta or potato. Now comes the egg part. I use egg whites, but eggs or egg beaters work too. I guess how much is needed to basically fill the pan, and pour that amount of egg whites into a mixing bowl. Then I whip the egg whites until they are frothy and add them to the pan. Stir the mixture. Add about 1/2 cup of cheese. More if you really like cheese. Low fat cheese works well - fat-free does not work very well. This is the time to add herbs (fresh from the garden is wonderful!) and salt and pepper. Or whatever spices you like. Stir the cheese and spices in and let cook. This needs to cook until the mixture is set and you don't have any liquid spots. Once set, sprinkle Parmesan cheese on the top of the fritatta and take off of the stove. Put the pan under the broiler until the cheese is golden brown. Ready to serve! With crusty French bread. Yum! For more great recipes, check out The Grocery Cart Challenge Recipe Swap! If you have a recipe to share, please join in the fun! What a great leftover recipe! Perfect for those little leftovers! I love this! I'll be trying this one out soon. Thanks for sharing. That is an excellent use of leftovers! It sounds delicious!!! Tuesday Garden Party - What to do about critters? Odd tree with purple berries in our yard..